In the original book, The Wonderful Wizard of Oz, author L. Frank Baum gave the Wicked Witch of the East a pair of powerful silver shoes that became Dorothy's when her Kansas farmhouse dropped out of the sky and landed squarely on the witch. Whether or not Baum meant those silver shoes skipping down a golden road as a commentary on the late-19th-century debate over basing American currency on a gold or silver standard (more on the book's political context here), his vision of silver shoes remained intact in early versions of the screenplay (see image above) for the classic 1939 film, The Wizard of Oz. Yet the shoes were certainly not silver in the final film. 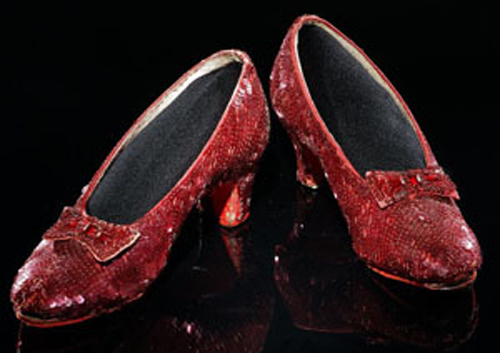 The Ruby Slippers are among the most popular and treasured artifacts at the Museum. While we may never be certain why Baum chose silver, we do know exactly why Dorothy's shoes became a pair of sequin-covered, iridescent ruby slippers in the movie. The answer: Technicolor. Technicolor, Inc. grew out of the eponymous engineering cosulting firm founded by MIT graduates Herbert Kalmus and Daniel Comstock, and the technically adept W. Burton Wescott (the "Tech" in Technicolor was a nod to Kalmus and Comstock's alma mater). 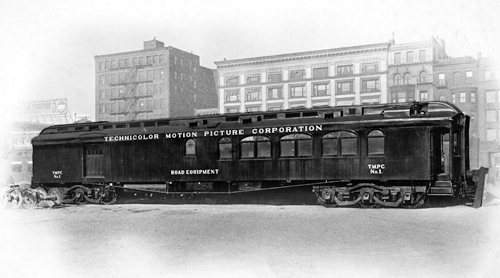 Technicolor’s first lab was built inside this railroad car, around 1915. © 2014 Smithsonian Institution; photo by Jaclyn Nash. In 1938, Kalmus spoke about the beginnings of the company: "The earliest Technicolor laboratory was built within a railway car. This car was completely equipped with a photochemical laboratory, darkrooms, fireproof safes, power plant, offices, and all the machinery and apparatus necessary for continuously carrying on the following processes on a small commercial scale; sensitizing, testing, perforating, developing, washing, fixing and drying positive; printing, developing, washing, and conditioning air; filtering and cooling wash water; examining and splicing film; and making control measurements and tests." Technicolor went through several iterations before it reached its full glory in the 1930s. Technicolor Process Number Four, or 3-strip Technicolor, used in The Wizard of Oz, wasn't a type of film, though. Instead, the action was filmed with a newly-invented motion-picture camera that contained a prism and colored filters that, in turn, separated and captured the scene onto three different strips of black-and-white negative film. Each strip correlated to the filtered colors of red, green, and blue, and was used to create an intermediary strip called a matrix. In a method similar to lithography, the matrices were dyed and then used to print the final movies that were distributed to theaters. Making a Technicolor feature film was such a complex undertaking that movie studios were required to hire specially trained Technicolor staff to oversee production. These included color consultants, under the direction of Natalie Kalmus, Herbert's ex-wife. A former art student, Natalie became the ultimate mediator between the lab and the silver screen, unwavering in her commitment to make Technicolor shine. She made decisions about makeup, costumes, sets, and lighting, and even went behind the camera as a cinematographer a few times. She controlled (some say with an iron fist) the aura of Technicolor, describing her role as "playing ringmaster to the rainbow." 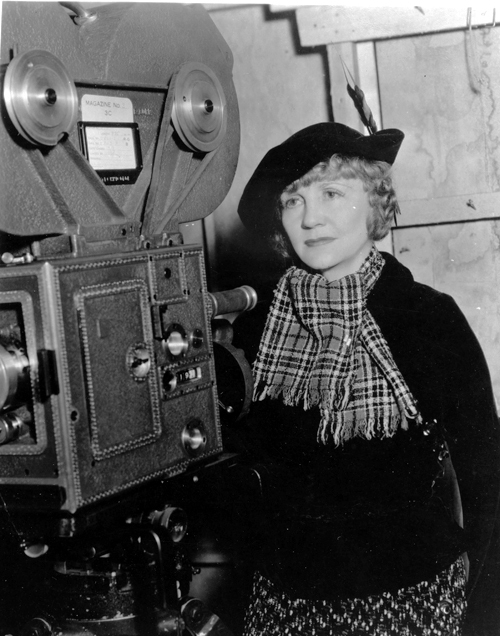 Natalie Kalmus with the 3-strip Technicolor camera, around 1938. Courtesy of Mark Wanamaker/Bison Archives. Natalie Kalmus and Henri Jaffa were the Technicolor consultants on The Wizard of Oz. We don't know if they played a part in transforming Baum's silver shoes into ruby slippers or if costume designer Gilbert Adrian and screenwriter Noel Langley came to the decision independent of their influence. But with one seemingly simple change, an American icon was born. The Museum's collections are rich in artifacts from The Wizard of Oz and the Technicolor era, and the Ruby Slippers are among our most visited treasures. The image of Dorothy clicking those sequined heels together three times, repeating, "There’s no place like home," is part of our shared memory. Would the Ruby Slippers have attained such star status if they had remained silver?